How do you get more leads? How do you close more sales? You’ll find the answers to these questions and much, much more in Print Sales and Marketing. 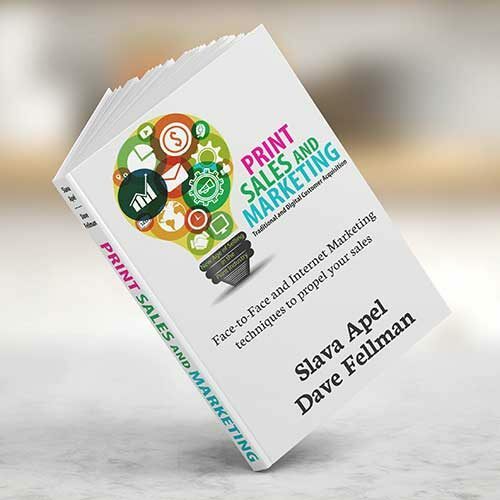 Slava Apel and Dave Fellman have more than 60 years of combined experience in the printing industry. In Print Sales and Marketing, they explain the Top 10 Methods of advertising on the Internet, and how each stacks up in terms of knowledge required, automation potential, cost and ROI. They explain Social Media Marketing, not just how you can use it to build your business, but also how you can guide customers to use it to build their own businesses. The explain how to follow up efficiently and effectively on leads and inquiries, and also how to apply “traditional” prospecting strategies to the modern marketplace. Finally, they explain how to make the time for all of this. Print Sales and Marketing will help you grow your business in the Internet Age!